Colombo, once known to be “kolonthota,” has always been identified as a wetland complex at the heart of the Kelani river delta. Today this city is increasingly drying up, with around 20 sq km left as wetlands which continue to be threatened every day due to human encroachment varying from dumping solid waste to land reclamation for mass-scale developmental projects. The misconception of development as synonymous to large-scale infrastructure development programs at the cost of the environment is one of the largest threat to our wetlands right now. While the right to development is unarguably important, policy making should not be clouded with the misconception of “develop now and clean up later”. In the 13th Conference of the Parties to the Ramsar Convention on Wetlands (COP13), which was held in Dubai on 25 October, 18 cities were declared as wetland cities across the globe where Colombo emerged the only South Asian city amongst them. Rebranding cities as wetland cities under the Ramsar Wetland Accreditation scheme is an initiative that began in 2012. Accordingly, cities located in the vicinity of wetlands and dependent on wetlands are encouraged to utilise urban and peri-urban wetlands sustainably. The Ramsar convention identifies lakes and rivers, underground aquifers, swamps and marshes, wet grasslands, peatlands, oases, estuaries, deltas and tidal flats, mangroves and other coastal areas, coral reefs, and all human-made sites such as fish ponds, rice paddies, reservoirs and salt pans as wetlands. 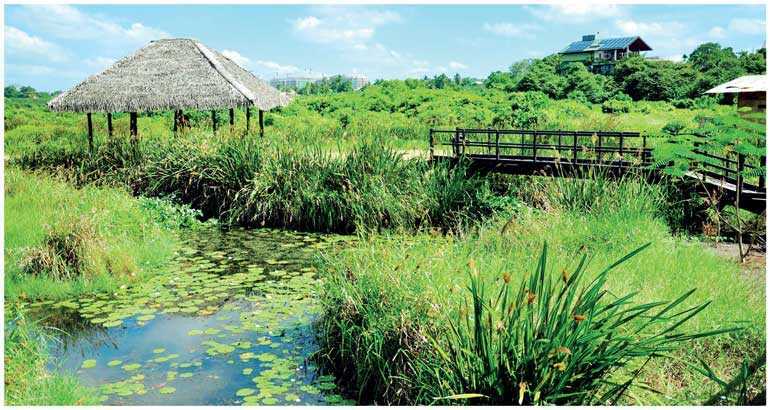 The wetland complex in Colombo spreads across Diyawannawa, Beddagana, Thalawathugoda, Kotte, Kolonnawa, Thalangama and Ambatale rendering a mammoth of services, which are often looked over by stakeholders. According to Environmental Foundation Limited (EFL), wetlands are an indispensable asset due to all the services they provide the Colombo city with. Some of these services are indispensable. For example, Colombo wetlands are estimated to carry 39% of the city’s storm water thereby functioning as a natural barricade against flooding of the city. By sequestering carbon it also mitigates climate change. Wetlands also purify water, absorbing contaminants and pollutants. They are natural cooling agents without which cities will continue to become warmer. It also serves as a source of socio-economic supplements for urban dwellers who are dependent on wetland for the daily sustenance of their lives. The rich vegetation purifies the air in the city and performs various bodily functions mitigating cardiopulmonary and respiratory diseases of urban and peri-urban dwellers. These services rendered by wetlands are socio-economical. The issue arises where the public, municipal planning and decision makers do not calculate in these economic benefits of wetlands and overlook how wetlands make cities liveable. Shifting this mindset thus is a fundamental part of the wetland city project. Colombo’s Ramsar journey: What does it mean to be accredited as a Wetland City? Accreditation as a Wetland City does not confer any legal rights or legal obligations on the city or Sri Lanka. The predominant objective of accrediting wetland cities is to create models for the study, demonstration and promotion of the Ramsar Convention’s objectives, approaches, principles and resolutions. An accredited wetland City is one which, through its inhabitants, its local government and its resources, continuously promotes the conservation and wise use of any Ramsar Site(s) and other wetlands within or nearby the limits of the city, respecting its physical and social environment and its heritage, while supporting the development of a sustainable, dynamic and innovative economy as well as educational initiatives in connection with these wetlands. Given the uneven development drive in many cities especially in the global south, such accreditation places the policy makers in the spotlight in ironing out certain development plans with the principles of sustainability in mind. Intergenerational protection of wetlands parallels with the United Nations Sustainable Development Goals (SDGs) in building sustainable cities (goal 11) and ensuring the availability and sustainable management of water and sanitation (goal 6). The question now is whether Colombo is ready to be rebranded as a ‘wetland city’ due to the politics associated with environmental conservation. In certain cases, some wetlands are being directly encroached by politically-backed parties, where the conflict of interests not only victimises the wetlands but also destroys the pristine environments leaving the biodiversity of these wetlands at stake. Sadly, even if Colombo is a wetland at heart, there seems to very little incentive to protect these wetlands on the part of certain stakeholders. Hopefully, even if the wetland accreditation bears no monetary funds for conservation the politics of conserving the wetlands in Colombo can now underscore the Ramsar standards if promises are put into practice. Wise use, conservation and management and trans-boundary cooperation are the three main pillars of the Ramsar Convention. In light of these embedded principles it is apparent that conserving wetlands in urban and peri-urban settings require a multi-stakeholder approach involving the government, local communities, non-governmental organisations as well as industries. Alongside the policymakers these entities has to play a strong role in conserving wetlands particularly in an urban setting. EFL reported an ongoing case in Thalangama where a private landowner was conducting illegal constructions and land filling activities in the Environmental Protection Area (EPA). In addition to the irreparable damages that are being caused to the environment, the livelihoods of 175 farmers in the area who relies on the Thalangama tank were threatened by these activities. Even if the authorities were notified, they remained silent and inactive despite the clear violation of the mandate under the National Environmental Act (NEA) which specifically provides for the protection of this environmentally sensitive area. In the last few years EFL has also been an active participant in the protection of the Muthurajawela wetlands. When the National Wetlands Policy (NWP) document was been formulated back in 2004 there were several observations made by EFL which persist as valid concerns even today. Accordingly, it was highlighted that the NWP requires a clear institutional framework for implementation. The NEA is inadequate in terms of conserving wetlands as it is largely concerned with general environmental quality and management. Given the peculiar environmental features of wetland it requires a specific legislation predominantly focusing on the conservation and the management of the wetlands. Thus, in order for the NWP to be meaningful policy makers should strategise the blueprint. Although the Colombo Wetland Management Strategy is in place, in practice holding Government agencies accountable is quite problematic as seen in the Thalangama case. This is why it is crucial to move beyond the top-down approach and actively engage the community in protecting the wetlands concerned. The Wetland City accreditation highlights the vitality of systematically integrating wetlands protection into the urban and peri-urban localities. Thus, rebranding Colombo should go hand in hand with community awareness and education in terms of the value of wetlands to cities. Integrating wetlands into eco-tourism would result in destination wetlands, pushing Colombo to be more than just a transit city, which is also a key concern. In this way, capitalising the economic carrots of wetlands incentivises its conservation and management. Since it is futile to rebrand Colombo as a Wetland City if the Government agencies continue to turn a blind-eye at the polluters, rebranding Colombo as a Wetland City will require the active engagement of the local communities to hold the polluters accountable to pay for their actions.